You’ve taken approximately 87 pregnancy tests. You’ve started taking prenatal vitamins religiously (if you hadn’t been already). And, you may even be experiencing some of those joyous early pregnancy symptoms, like fatigue and morning sickness. 1. Depending on your doctor, the timing of your first ultrasound will vary. Many doctors, including mine, do a “dating” ultrasound around 8-10 weeks to accurately date the pregnancy. You might have your first one later, at 12 weeks for a NT scan (which is the first trimester screening for chromosomal abnormalities) or even at 20 weeks for your anatomy scan. For the rest of this post, I’ll be focusing on the first dating ultrasound. 2. You should bring your significant other with you. This is a no brainer, right? Of course your significant other wants to see his progeny! But, unfortunately, some women do not receive positive news and having a supportive partner there is important. 3. 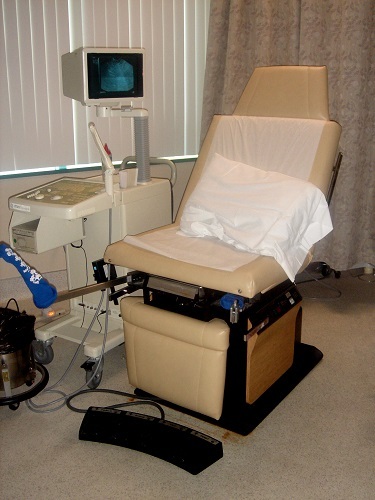 Your ultrasound may be transvaginal and you may need to drop trou. Yup, the ultrasound tech may need stick a wand-like instrument into your lady business. During those early weeks, your little one may be too small to see well with an abdominal ultrasound. You might find this a little uncomfortable, but it isn’t much different than inserting a tampon. And, you will be given a sheet so you won’t be exposed during the exam. 4. Your baby will look like a jelly bean/gummy bear/some other amorphous object. Expecting to see a teeny, tiny baby? Your bundle of joy may look more like a little blob. But, it will be the cutest little blob you’ve ever seen! 5. Your tech may be chatty…or not. Like everyone else, ultrasound techs have different personalities. I’ve had a bajillion ultrasounds, and my very first tech was nice, but no nonsense. I had others who would let me just watch the baby doing something cute. It just depends! Either way, if your tech is quiet and you’re getting nervous, just ask her what she’s doing! She has lots of things to check on and measure, so don’t worry if she’s not very chatty and do NOT be afraid to ask questions. 6. You’re going to learn lots of fun things about your baby…and body. At my first ultrasound, I learned the estimated due date (spot on based on my own estimations), which ovary released the egg that became our sweet girl (the right, in case you were wondering), and, of course, our baby’s heartrate. She also pointed out the umbilical cord and where the placenta was going to be, and measured and checked lots of other things too. It really was a fun, and informative, experience! 7. You will probably get pictures. In most cases, you will receive pictures at every ultrasound you have. 8. You may want to bring baby wipes. Not for the baby, silly, for you! Whether you have a transvaginal ultrasound or an abdominal ultrasound, techs will be using some kind of slippery, jelly-like stuff on their equipment. They should supply wipes or towels for you, or allow you immediate access to the bathroom to freshen up, but, if not, it would be a bad idea to have some on hand for quick clean-up! Your first ultrasound is a wonderfully special event, your first glimpse at that little life-changing bean. Enjoy it! Jennifer and her husband, Robert, live in Tidewater, Virginia, and expect their bundle of joy to arrive in November 2013. (Check out her baby guessing game – you could win $100!) Besides expounding on the amazing/scary/life-changing topic of pregnancy, Jennifer is the full-time blogger behind Not Your Momma’s Cookie, where she tries to make cool treats and frequently shares embarrassing stories. Thank you for putting this into words!!! lol I have had my share and you’ve got it down pat!! Since it’s too late for me to have more (old lady frownie face), I will be sharing this with my daughter and some friends who are just starting out (or planning) their awesome parenthood journeys!! !